There’s no question you’ve heard the phrases digital transformation and the Internet of Things more than a few times. The focus on these digital capabilities remains high as service expectations shift towards responsive, outcome-based models. Companies that successfully evolve their service models have an opportunity to monetize results from digital transformation and IoT strategies. After working closely with manufacturers and service companies on their digital strategies, we’ve seen first-hand how these innovators capture a competitive advantage and earning power. Service leaders have already deployed digital transformation strategies and are in the process of adjusting service operations to provide higher levels of service and to monetize the outcomes. Evolving service models is not an easy job and it requires much more than just technology. Traditional service processes must change, which affects teams across the organization. Companies that approach these new digital capabilities with realistic adoption plans and change management strategies are the ones finding the most success. We’ve partnered with service industry leader, Technology Services Industry Association (TSIA), to create a two-part blog series about The Role of Digital Transformation within Services. We sat down with TSIA VP of Field Service Research, Vele Galovski, to talk more about digital transformation and how to monetize services. 1. How do you describe digital transformation and why is industry embracing it now? Digital transformation is a phrase used often and it can mean many things to many different people. Ultimately, I describe it as embracing digital technologies to impact the business value chain and ecosystem. It includes the application of digital technologies to fundamentally change the value by improving customer outcomes and positively impacting suppliers. These three technology trends provide a strong case as to why the industry is embracing digital transformation. On top of this, an even bigger factor is the disruption in the traditional business model for hardware and equipment manufacturers. Feature functionality is the norm and making products “a little bit better” just doesn’t cut it anymore. This factor means that revenue streams are negatively impacted as customers look for new ways to consume technology. In some cases, customers are asking manufacturers for service models where payment is based on the outcomes delivered. With both the trends and the evolution in business models, it’s becoming inevitable for these companies to embrace digital transformation and reinvent their go to market for continuous innovation. 2. What role does the Internet of Things/IoT play in digital transformation? 3. How is this technology impacting the customer experience and helping companies monetize their service models? 4. Are there any mistakes companies looking to digitally transform should be careful to avoid? Any specific advice for enterprises? The biggest mistake I’m seeing is when product companies just focus on their products and their traditional business model – make, sell, ship, and attach services. For these companies, it’s more about selling products and providing an inexpensive service. If this focus is the limit of their service model, it’s most likely leaving their customers wanting more and asking why the price of the product isn’t lower. It is important for these product companies to look beyond their traditional product sales and see what their customers can gain from IoT enhanced services. Over time, the IoT data they collect on their products will become more valuable than their product. These companies will have the advantage of using data to give them insight to their customers’ outcomes, which they can use to help customers reach their outcomes. It will take a while to get there, but if you start with that purpose in mind, you can collect data across the entire install base and deliver valuable insights. 5. For companies looking to embrace digital transformation and IoT, what are some recommended go-to resources they can look to for getting started and next steps? Thank you for spending time with us, Vele. We appreciated hearing your insights on digital transformation and IoT. 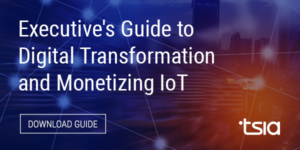 To learn more on how you can monetize services, check out TSIA’s “Executive’s Guide to Digital Transformation and Monetizing IoT”. For more information on TSIA and how you can become a member, visit TSIA.com. Check out part two of “The Role of Digital Transformation Within Services: How to Achieve Business Model Innovation with IoT”. In this second blog, TSIA interviewed our COO, Jereme Pitts, to discuss the importance and approach to innovating your business model with IoT. Mobile Video For Enterprise – What’s the difference?